and for less than the largest manufacturers. ship your order so you never have to stop working. for the right combination of price, quality and supply times. 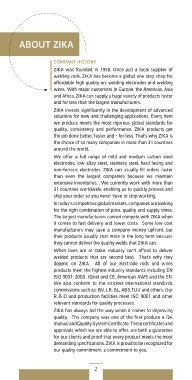 they cannot deliver the quality welds that ZIKA can. ISO 9001: 2008 , IQnet and CE. American AWS and the EN. relevant standards for quality processes. our quality commitment, a commitment to you.